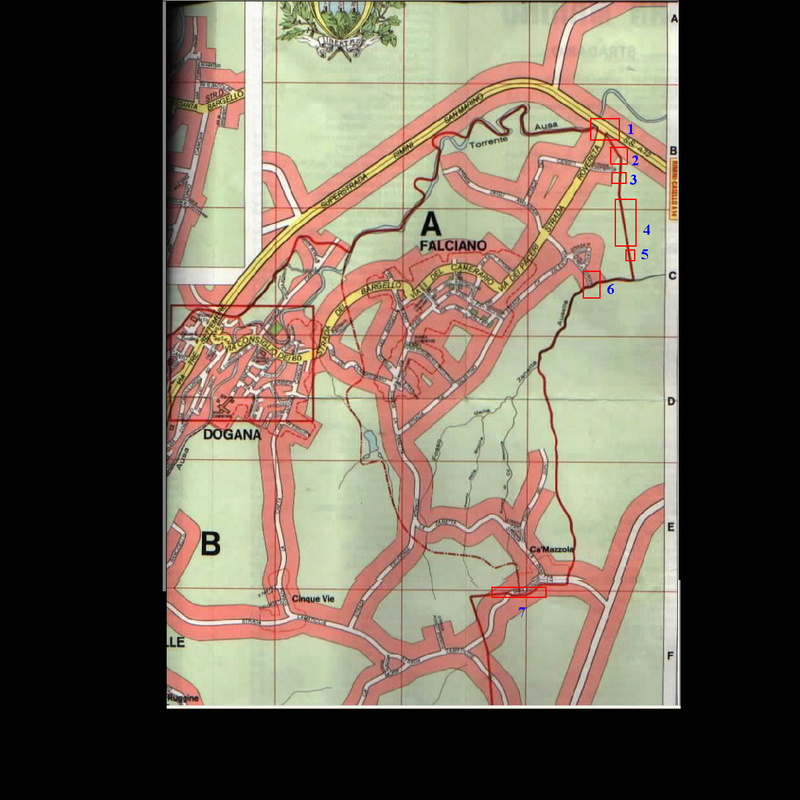 1) Map on left identifies where the pictures were taken. 2) Left photo taken at point 1, looking NW. I believe the border follows the yellow curb on left and then the arching break in pavement the makes a sharp left. RSM-left, Italy-right. 3) Same location looking the opposite direction. I believe the border follows the metal railing on the right, then crosses the road where the pavement changes, then follows the yellow curb, turns right and goes through the parking lot of the car dealership. Italy-left, RSM-right. These two pictures are also taken at point 1 on Map 1. 1) Left photo is the marker you can see in the right picture above. I don't think it's a border marker (could be though? ), but rather a utility marker. It appears to be located inside San Marino. 1) Left photo was taken at point 3 on map above. Looking from RSM into Italy through the fence. If you look carefully at Google Earth you can see this fence line, which corresponds with the border, according to the maps I've seen. I think the border is a meter or less on the other side of this fence. 2) Right photo taken a bit further down the fence (Point 4 on map) from the RSM side. Italy is on the other (right) side of the fence. Again, I believe the fence is entirely within RSM, because it marks the property line of an industrial park that is visible on the left. Both of these photos were taken at point 5 on the above map. 1) Left photo--a small road crosses the border here just below the fence on right above. RSM-Right, Italy-Left. 2) Right photo--just to the right of the left photo, looking in a southerly direction toward a stream marked by the trees. At the point the border meets the stream, the border is located in the stream. The stop sign is a warning not to enter because it is private property. All three taken at point 6 on map above. 1) Left--At this point the border is in the stream. This bridge crosses the border near/at Falciano. Taken from RSM into Italy. 2) Middle--This is a close-up of the sign that is visible in the left picture on the bridge. It's the only indication one is entering Italy. 3) Right--the stream that marks the border at Falciano. 1) Left--The same bridge at Falciano looking from Italy back into San Marino. 2) Middle--taken at point 7. This is looking eastward along a small road (Via le Bosche). According to the map and people living in the white house, the border runs down the middle of this road. It is newly paved. The garden on right is in Italy, the car and house are in RSM. 3) Right--taken at point 7. This is looking SW from the same spot as picture 2. The dirt driveway is heading into Italy, and the organge sign to the left is the only indication you are entering Italy by going onto this dirt road. 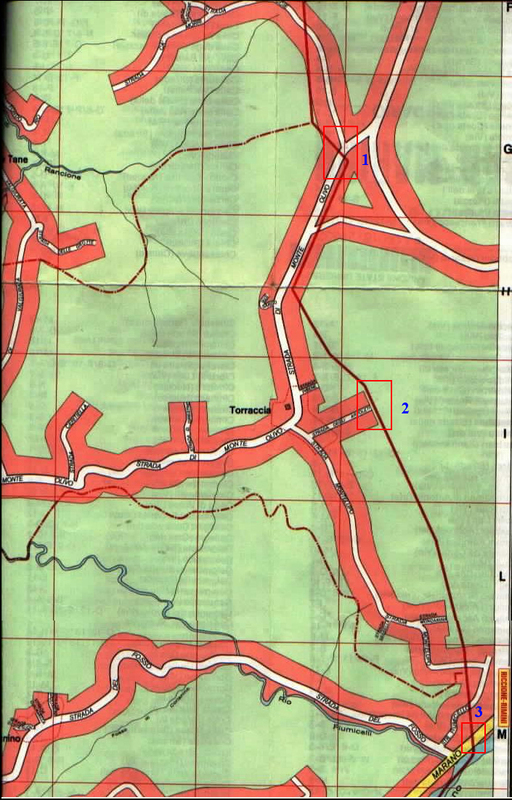 1) Left--map shows three points where photos were taken. 2) Middle--Looking SE across Strada Monte Olivo at photo point 1. The border crossing the Strada is clear in the pavement. Old marker visible, but no dates are legible on the marker. From the marker the border takes a sharp turn to the right and follows the edge of the road for some time. 3) Right--The other side of the street at the same point. Again the orange sign to the right informs drivers that they are now entering Italy. The road directly ahead is in Italy to a certain point, then the border crosses it, too. The care is just inside Italy. 1) Left--Close-up of the marker at point 1, looking NE. It appears to me that the letters C/A (barely legible) are transposed. This might be intentional, or it might mean that sometime in history the marker fell over and was re-placed facing the wrong direction. 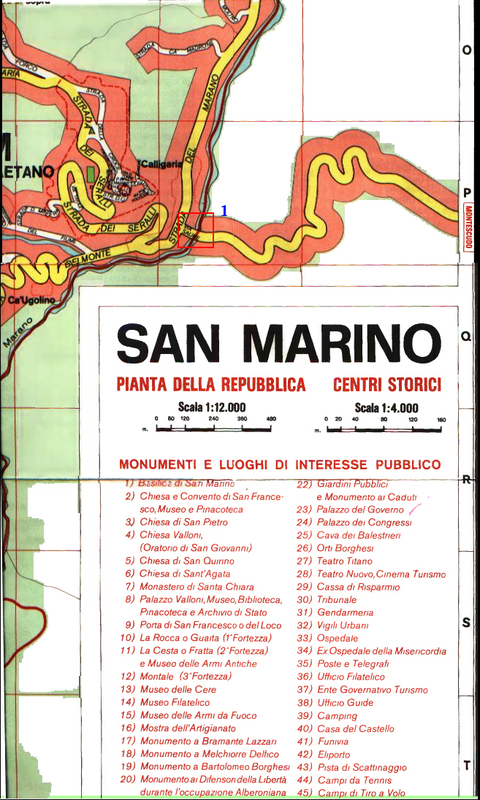 I'm assuming the S is for San Marino, while the C is for Caccia--the municipality on the Italian side. 2) Middle--The old marker is just to the left of this picture. TheWelcome to RSM sign is visible on the right. The border runs along the left side of the road. The reflectors on the right side are black, white and orange, while on the left they are black, white and white. 1) Left--taken at point 2, where the dirt road ends at the border. The border is marked by these orange stakes. RSM on right, Italy on left. 2) Right--turning to my left I take the photograph looking into Italy. The orange-painted steel rod is visible marking the border with the orange sign again letting crossers know they are entering Italy. 1) Left--taken from point 3 on the map. Looking eastward into Italy. 2) Right--taken from opposite side of the street at point 3. The other side of the same sign, with river (trees) behind. 3) Right--this photo is from point 3 on the map, with Welcome to RSM sign, looking N-NE. I think the borderline is at a sharper angle than the pavement change suggests. 1) Left--map shows one point where photos were taken at Faetano. 2) Middle--at Point 1, the bridge crossing into Italy. 3) Right--a close-up of the Italy sign. 2) The border creek under the bridge at Faetano. 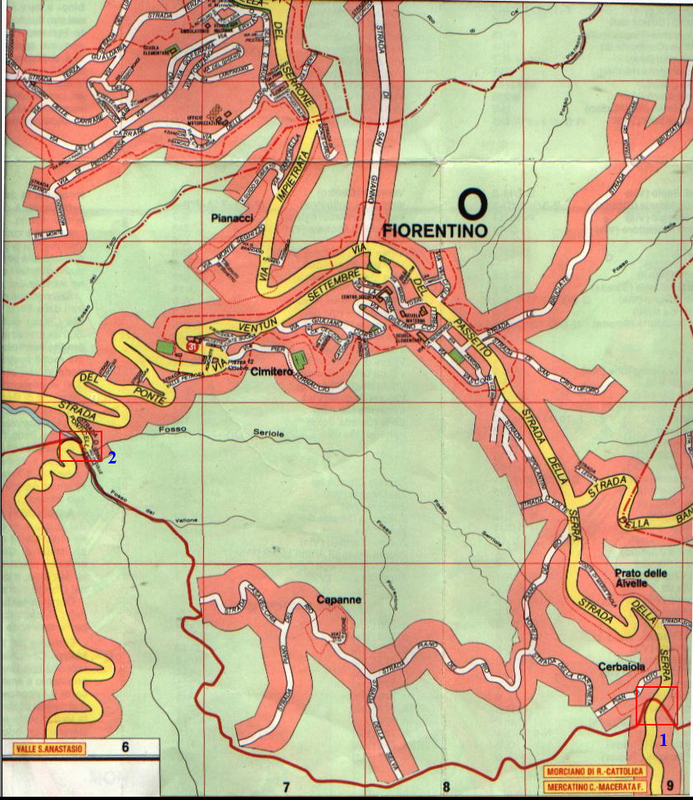 1) Left--map shows two points where photos were taken at Fiorentino. 2) Middle--Welcome gate at point 1, looking into RSM. The pavement change is notable under the sign. Just to the left of the sign, an old stone marker is visible. The border crosses the road here, but to the right of the archway it follows along the right side of this road, roughly along the small fence. 3) Right--This picture is taken from a position behind me in picture 2, further into Italy. This sign is also in RSM, just barely, or it might be in Italy, of the garden fence is on the border. The owner of the house inside the fence understood English and confirmed this as regards his property line. This jog in the border can be seen in the map on the left, although it doesn't precisely show it hugging the roadside. 1) Left--This is the border under the big archway at point 1. Again, the stone marker is visible across the road. 2) Middle--this is the old border marker under the sign. 3) Right--the marker is just to the right, again at point 1. The fenceline appears to follow the border, or vice versa. 1) Left--at point 2, the bridge crossing into Italy at another point in Fiorentino. 2) Middle--a close view of the same...notice again the little orange sign is the only indicator of crossing into Italy. 1) Left--the main border crossing from Rimini (Italy) into RSM at Dogana. The border is in a very small stream under this road. 2) Middle--a close-up of the same position. 3) Right--the Welcome to RSM archway, just inside the country. Notice the RSM police on the bottom right. The day I was there in September 2006, they were stopping traffic from Italy at the border to check for drunk drivers, etc....I don't know what else.